What Space Mission Was The First To Visit Two Planets? The Apollo Program Space Suits Were Designed By Which Company? 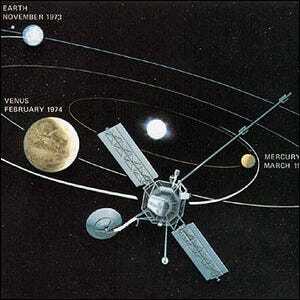 In the early 1970s NASA’s spacecraft Mariner 10 went into the record books for two distinct feats. It was the first spacecraft to use interplanetary gravity fields as a sort of gravitational slingshot. It was also the first space mission to visit two planets. Launched in late 1973, Mariner 10 first flew to Venus and then, using Venus’ gravity to modify its trajectory, swung around to visit Mercury. Mariner 10 made observations of Venus and Mercury’s surface, atmosphere, and other physical characteristics. Mariner 10’s contributions to our understanding of the two planets include mapping out 45% of Mercury’s surface and providing evidence of rotating clouds and weak magnetic fields on Venus.